My short story is that the race was hard (which I expected based on my training), but with a stronger result than I thought I could manage (yay! ), and generally a really great race. 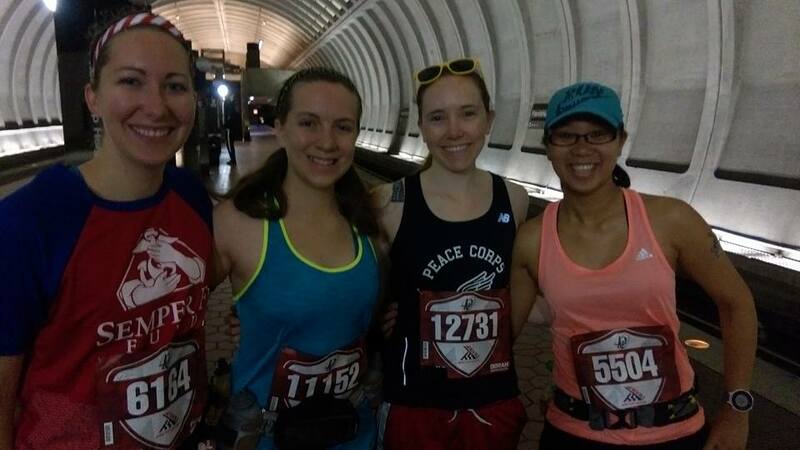 The Marine Corps Marathon is as much about the experience as it is about the race. These are some of the things that stick out to me about the race and the experience. The early parts of the race were somewhat of a blur because the first few miles are the miles where nothing really registers other than nerves and excitement. They had by far the best pre-race entertainment of any course I’ve done before – flyovers, precision parachuters, and historical artillery, oh my! The first few miles were hectic. 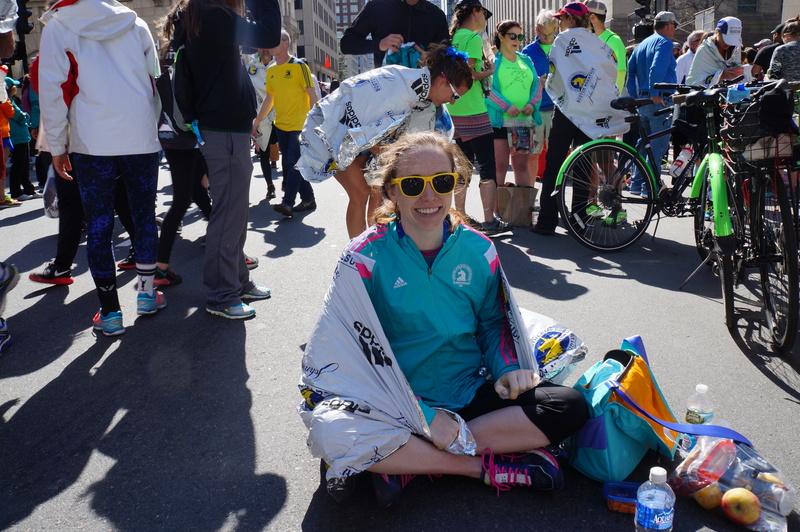 I’ve run in large races before, but struggling for personal space (and sometimes even breathing space) in a horde of 23,212 marathoners takes a while to work itself out. 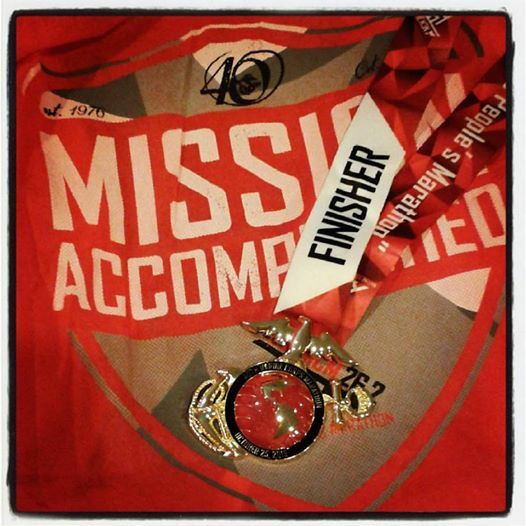 I didn’t have any hard and fast time goals, but I was hoping for a sub-4 hour marathon. I tried to go out conservatively, but running on feel is hard when the feelings are fueled by excitement. At 12 miles in, we hit the blue mile. The blue mile is one of the traditions of the MCM that honors fallen soldiers with pictures. After the pictures, the course was lined by volunteers holding American flags. I was told it would be an incredibly powerful mile, and I found that to be entirely true. I managed not to cry though. Way to go Kathy Cathy Lizzie! PSA: The new Star Wars movie opens in 54 days! You started this, now let’s finish it! 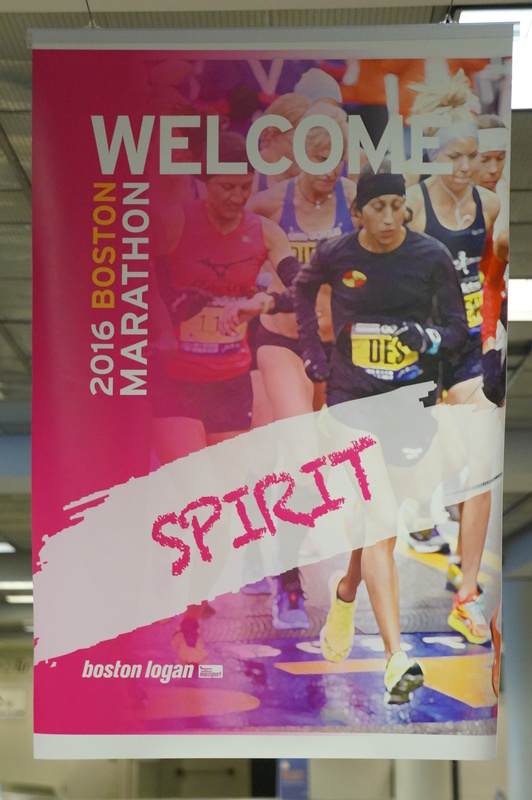 (Dear Boston organizers, please write out the Harry Potter books on signs spaced out every 20 feet along the entire 26.2 miles. Think you can do that? I’d really appreciate it!). After that, we entered the monuments and museums section of the race, and crowds were packed in along the national mall. One of the things I have learned from my races is that the crowd’s excitement and the runner’s excitement feed off each other. 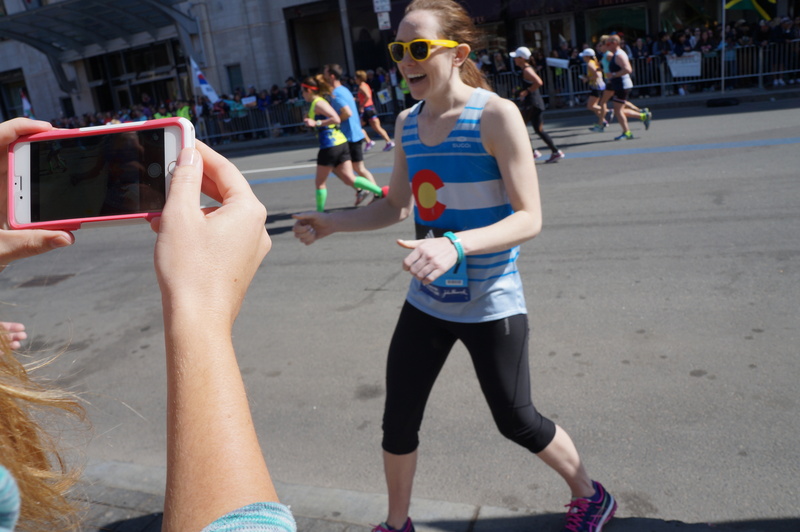 Whenever I got really excited about seeing the crowd, they would respond with even more cheers, which fed my excitement for running a marathon. I especially enjoyed it when people called me out specifically – “Go Peace Corps!” (My shirt said “Peace Corps” on the front, so that was how people addressed me). This was fun while it lasted, but it made it even more noticeable when we got to the bridge, which, being a bridge, had a distinct lack of spectators. Crystal City kinda made up for that, and those miles felt like a party. 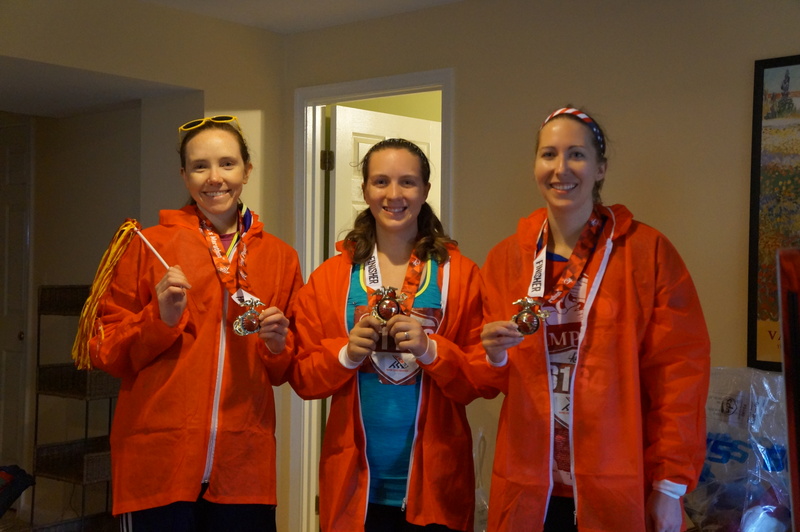 I picked up a can of Coke somewhere along mile 22 (which I held onto because it sounded really good at the time and I wanted it at the end of the race. I opened it about 3 hours after the race, no explosion!). But the start of the bridge marked the last 10k of the race, and I was running on empty by that point. I wasn’t overdoing it, but I was exhausted and kind of entered a state of delirium. In the last few miles, my breathing was quick and shallow, but not from running too hard. From running too long. Nothing mattered other than continuing to put one foot in front of the other, and I managed to do so at a pace that was faster than walking. My Garmin had long since stopped working (it had spazzed out and lost signal 3 times along the course, so I had given up on it by that point), and I had no idea what my actual pace was. I knew it would hurt as soon as I crossed the finish line, but I would do whatever it took to get across the finish line in under 4 hours. By some miracle, I managed it. I came up the hill (thinking: looks like walking, feels like death), and the clock read 3:59:38. I knew it had taken me a few minutes to get to the starting line, so my actual race time was a few minutes shorter than that, but I absolutely had to make it to the finish line before the clock hit 4:00:00. I think I finally crossed around 3:59:49. Then it hurt. Everything hurt. I joined the forward shuffle through the finishing area, worried that if I stopped for even a second I would never move again. Someone gave me a bag to hold all the finish line food. Eventually my bag held one bottle of water, two bottles of Gatorade, two bananas, my can of Coke, and a box of snacks. It felt like a lead weight on my arm and I barely had the strength to carry it. I continued to shuffle the almost half mile to the bag drop (who decided it was a good idea to put the bag drop so far from the finish line? What if I got hypothermia because I wasn’t able to get to my jacket soon enough?). When I got there, I kinda crumpled over to lean/lay on the table. The nice lady retrieving my bag told me I should have a seat. Then I started to cry, so I sat down for a few minutes with my bag of food one one side and my bag of clothes on the other. I went back t0 a med tent to get some Tylenol because I couldn’t do anything with my feet. My feet hurt when I moved. They hurt when I stood still. They hurt when I sat down. So I took some Tylenol, sat back down, and after a few minutes I actually began to feel it taking effect. The rest of the day also passed in a blur. We waited around for our little group to reconvene, caught the metro, took the best showers ever, and ate pizza and practiced horizontal running while watching Pitch Perfect. Overall, I feel really good about the race. Before the day was done, I was already giddy with anticipation for my next marathon (which will get its own post later). 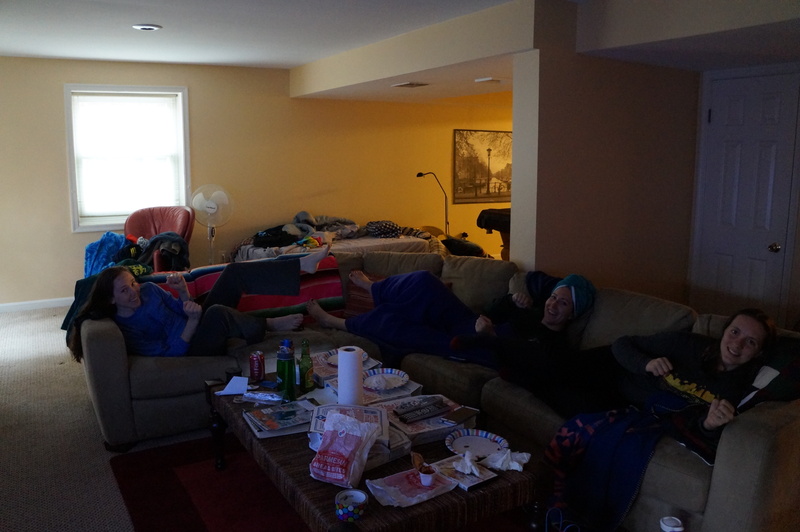 The next day, I woke up entirely mobile, though my quads and calves were quite sore. It’s not a PR, but I’m really satisfied with my effort. I had been telling people for a while that I planned to run a marathon/tour and take pictures along the entire route (and hopefully detour into the Air and Space museum). 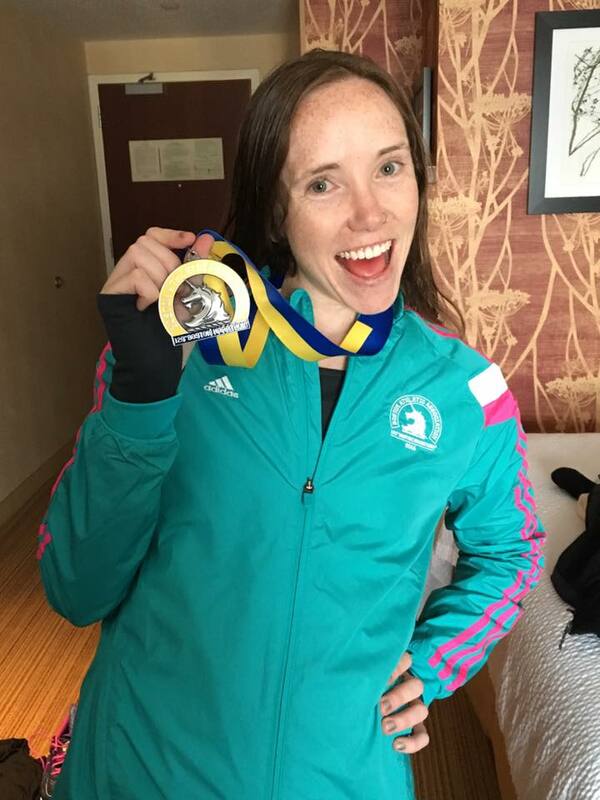 While I still think that would have been a fun way to run the race, it was somewhat of an excuse because I knew I wouldn’t PR this marathon and I wanted to have some tangible reason for not running a PR. In all honestly, I would have been disappointed in myself for doing that because I knew it was an excuse and I knew I wouldn’t give the race my full effort if I did that. 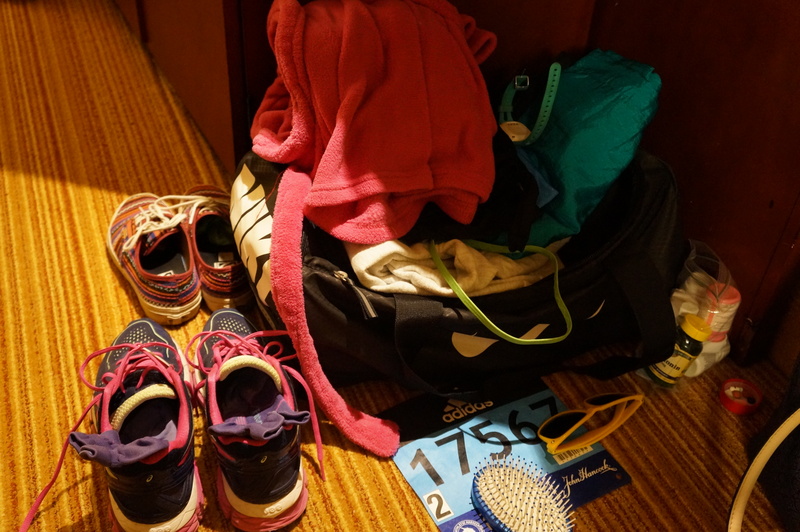 All it takes is all you’ve got, and I certainly gave that marathon everything I had.